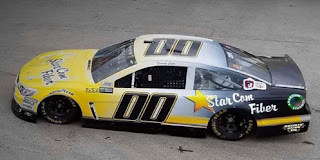 Derrike Cope picked up the 28th last-place finish of his Monster Energy NASCAR Cup Series career in Sunday’s Hollywood Casino 400 at the Kansas Speedway when his #00 StarCom Fiber Chevrolet fell out with handling problems after 35 of 267 laps. The finish, which came in Cope’s 423rd series start, was his second of the year, his first since the August race at Michigan, nine rounds ago. The finish tied Cope with Michael McDowell for third-most last-place runs in Cup Series history and closed him within two of Morgan Shepherd for third-most all-time. The finish has also vaulted Cope to third in the 2017 LASTCAR standings. With four races to go, Cope trails current leader Jeffrey Earnhardt by more than four in both Bottom Fives (14-9) and Bottom Tens (21-14). 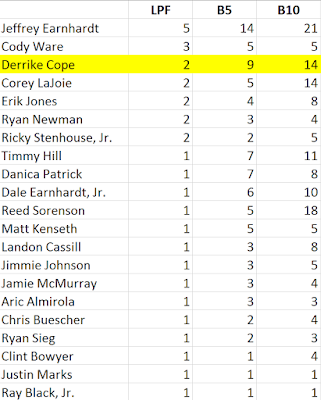 The only tiebreaker left for Cope is to score the most last-place finishes outright, requiring him to trail all four remaining races in 2017. 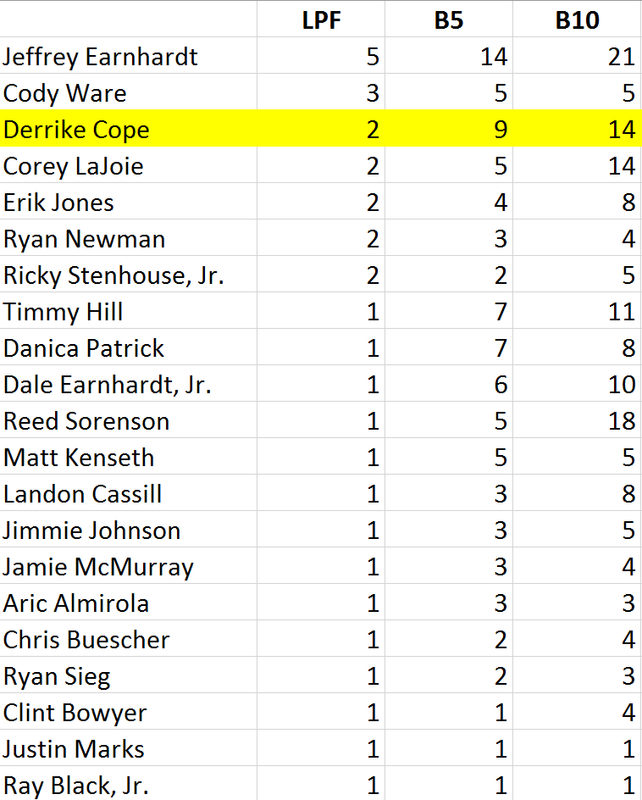 Thus, if someone other than Cope finishes last at Martinsville, Cope will be eliminated from title contention. Cope’s most recent last-place run in August saw the veteran start his eleventh Cup race of the season with Jay Robinson’s small two-car team Premium Motorsports. It was also the second of those starts with primary sponsorship from New Jersey-based telecommunications company StarCom Fiber, which joined driver and team for the spring race at Pocono. In September, Tommy Baldwin Racing was absorbed into Premium with Baldwin himself becoming Cope’s new crew chief. Their first race together was at Richmond, where both found themselves the center of controversy. With just two laps to go, Cope slipped out of the groove and made contact with the Turn 4 wall, drawing a caution that ultimately cost Martin Truex, Jr. his first win on a short track. A few days later, Cope announced that he and Premium had parted ways. In late September, news broke that Cope and StarCom Fiber were already in the final stages of assembling their own team: StarCom Racing. A social media push included photos of Cope working on his black, yellow, and white #00 Chevrolet at a small shop. The team office displayed the driver’s trophies, including his 1990 Daytona 500 checkered flag were displayed in the office. StarCom and Cope planned to make their debut at Dover, but on the Tuesday before the race, the team withdrew in order to finish hiring staff. A couple weeks later, the team announced they would make their debut at Kansas on October 22. At first, StarCom looked like they would have to qualify their way into Sunday’s field. The preliminary entry list held 41 cars, including Carl Long’s own single-car team, Motorsports Business Management (MBM), whose #66 Chevrolet made its own series debut at the track this past spring. But by Friday, MBM withdrew from the field, guaranteeing StarCom its series debut in its very first attempt. Cope turned his first ten laps in Friday’s opening practice, only to anchor the charts with a best lap of 170.025mph, more than three seconds off session leader Kyle Larson’s time and nearly a second slower than 39th-place B.J. McLeod, the last-minute driver announcement for Rick Ware Racing’s unsponsored #51 Chevrolet. Cope was unable to complete a lap in qualifying, originally listing him last in the field until Ryan Blaney’s car failed inspection, dropping his #21 Omnicraft Auto Parts Ford from 3rd to last on the grid. Cope ran slower in Saturday’s opening practice, managing a best of just 165.416mph, then picked up slightly after eighteen laps in Happy Hour with a top average of 165.996mph. Coming to the green on Sunday, B.J. McLeod pulled Rick Ware’s #51 to the rear to join Cope, who himself had moved behind last-place starter Ryan Blaney. As the field accelerated, Cope was already in last, and steadily lost ground to the rest of the field. By the end of the second circuit, the #00 was more than two full seconds behind 39th-place McLeod, and nearly 10 seconds behind race leader Martin Truex, Jr.
On Lap 8, as the leaders raced by on the outside lane, Cope ducked onto pit road, then by Lap 13 was in the garage, the crew attending to an engine issue. Cope returned to the track on Lap 35, 26 laps down, but soon after incurred the first of a series of pit road penalties, including speeding and driving through too many pit boxes. Still running off the pace, Cope pulled the car onto pit road on Lap 65, at which point he was now 33 circuits behind the leaders. He then made a second trip to the garage on Lap 72. Moments later, Kyle Larson made an unscheduled pit stop of his own, the crew looking under the hood. Larson returned to the track, only to lose the engine on his #42 Credit One Chevrolet on Lap 76, ending his day. While it appeared the run would drop Larson to last, Cope did not return from his second trip to the garage, and thus locked-up the last-place finish by a margin of 38 laps. The remainder of the Bottom Five was filled by the day’s most spectacular accident on Lap 199. A sideways Erik Jones in the #77 5-hour Energy Extra Strength Toyota triggered a fourteen-car pileup. Included in the carnage were 38th-place Danica Patrick in the #10 Code 3 Associates Ford, 37th-place Matt Kenseth, whose #20 DeWalt FlexVolt Toyota was parked for one too many crewmen servicing the car after the crash, and 37th-place Daniel Suarez, who struck Jones’ spinning car with the nose of his #19 Arris Toyota. *This marked the first last-place run for car #00 in a Cup Series race since October 11, 2008, when A.J. Allmendinger’s only start for Michael Waltrip Racing in the #00 Champion Mortgage Toyota ended with a Lap 52 crash in the Bank of America 500 at Charlotte. Prior to Sunday, neither the number – nor Cope – had ever finished last in a Cup race at Kansas. *StarCom Racing is the first Cup Series team to finish last in their first points race start since April 18, 2009, when Barry Haefele made his first start as an owner of the #73 Quality Concrete Dodge, only for driver Tony Raines to fall out with brake trouble after 56 laps. *StarCom Racing is also the first team to trail in their first-ever Cup entry since March 20, 2005, when Braun Motorsports’ first entry in the Golden Corral 500 at Atlanta ended on the opening lap when their #08 Win Fuel Chevrolet, driven by Shane Hmiel, was collected in a multi-car accident. *Cope is the first driver to finish last for two different Cup teams in the same season since 2014, when Mike Bliss finished last for BK Racing (Fall Loudon), then four times for Tommy Baldwin Racing (Atlanta, Chicagoland, Kansas, and Phoenix), securing him that year’s LASTCAR Cup Series title. This excludes 2015, when Timmy Hill finished last for Mike Curb at Michigan, then for Jay Robinson at Phoenix, as Curb sold his team to Robinson during that period. *Finally, Cope is the first driver to finish last in a Cup Series race due to “handling” concerns – since himself on August 26, 2006, when his Raynard McGlynn-prepared #74 Royal Administration Services / Sundance Vacation Dodge made it just 7 laps into the Sharpie 500 at Bristol.